Arizona Today, New Mexico Tomorrow? Summer in Santa Fe is a time when people love to gather outdoors in the cool evening air – and there is no shortage of opportunities to enjoy outdoor music festivals, dancing on the Plaza, the Opera, etc. But tonight, as I sit and look out at the almost full moon in the evening sky, one of the first things I contemplate is that I actually can sit outside this evening. And for this I am grateful. That’s because tonight there is no wind. For nearly two months, the wind has been blowing like crazy and the state has been in severe drought. Which makes sitting outside as much fun as being downwind of a bunch of kids in a giant sandbox, hurling the sand in every direction as fast as they can. And, for the past three weeks, the wind has also been delivering —straight to our front doors—the hideous smoke and ash from the fires burning in Arizona, near the New Mexico border. In fact, when I reflect on Arizona, it makes me wonder what’s going on in that great old state with the Grand Canyon and all those other fun places to visit (Sedona, Tucson, etc.). Because it seems like Arizona has had nothing but trouble for the past couple of years. So I turn to the locational maps and voila! There it is, right before my eyes. 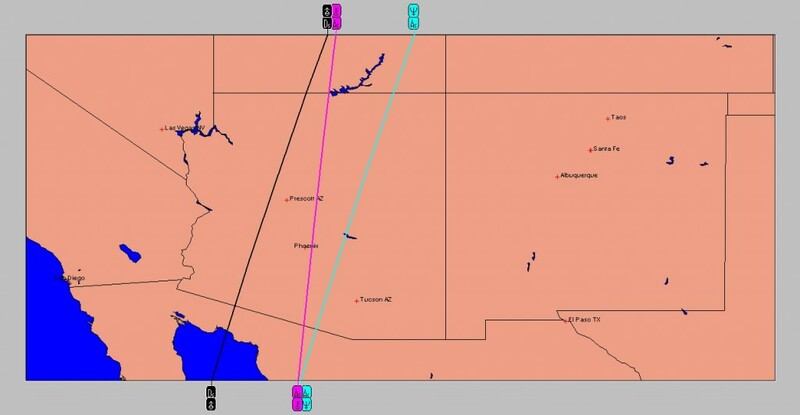 Two years ago, in the summer of 2009, the planet Neptune crossed into Arizona. This was about the same time the new governor, Jan Brewer, came in. Neptune has been transiting the last few degrees of Aquarius for what seems like forever now, and Arizona sits smack into those last few Aquarian degrees on the geodetic map of the world. Now, Neptune is a planet of the sea—remember Poseidon and Pisces and all its watery associations? What’s it doing in the desert? Never mind that it’s hundreds of miles away from a sizeable body of water on the ground, there’s not even any water falling from the sky these days. How can the god of the sea possibly survive in the desert? Evidently, not very happily. When Neptune entered Arizona two years ago, Jupiter was right beside it, with both of them moving through Aquarius. Seemed like it could be a propitious event, no? With the old and new ruler of Pisces aligned together. After all, isn’t Pisces a sign of compassion and humility and sensitivity? But Jupiter, the faster moving body, didn’t stay long, leaving Neptune to fend for itself all this time. Neptune is associated with dissolution, such as the great power and force of water pounding against the rocky shore and slowly eroding its mighty cliffs. Could we then assume that Neptune is slowly eating away and eroding some facet of Arizona’s infrastructure? The first thing to emerge was Governor Jan Brewer, who proclaimed open warfare on immigration. “Let’s build a great wall,” the governor said. Let’s show those illegals that they are not welcome here (even though they do all the jobs that the legal residents don’t care to do). From that came the Arizona boycott with several large conferences being cancelled, potentially driving Arizona’s economy right into the gutter. Once that fire cooled down, the next thing you knew was that a deranged gunman shot nineteen people at an open political forum in Tucson. Six were killed, including Christina Taylor Green, age 9. Congresswoman Gabrielle Giffords was the target, taking a severe gunshot wound in the head, but who is today recovering from what could have been a lifelong brain debilitation. Truly, a sad day for the nation, a very sad day for Arizona. That was January 2011, with Neptune still holding court in Arizona, but now joined by Chiron as well. Chiron is the gifted, wise healer/teacher whose lesson to humanity is that sometimes pain and suffering is the greatest teacher of all. It is what makes us human. Now, we have fires raging out of control in Arizona and at last count, 469,000 acres have burned, fueled by heavy winds. Nearly 10,000 people have been evacuated from their homes and the smoke is blowing to neighboring states where we’ve been warned repeatedly not to go outside for very long if we are suffering from any kind of respiratory disease. Oh, and leave your swamp coolers on “OFF”. No problem, it’s only 105 in the southern part of the state and high 80s in the northern part of the state. Neptune and Chiron will be dancing together, back and forth across the state of Arizona for another two years, until 2013. But wait, there’s more. A very slow moving invisible planet named Transpluto has also been stuck in Arizona with no ability to leave for quite some time. Transpluto, as its name implies, lies beyond the orbit of Pluto (which is already far enough away) but seems to pack an even more powerful punch than Pluto does. Astrologers know Pluto to be a planet of power. Transpluto has been called a perfectionist, and has also been considered a planet of unstoppable power and force of transmutation. And, reflecting on the events going on in Arizona for the past few years, I’d have to conclude that there is certainly a very powerful force of transformation and transmutation going through Arizona now. Transpluto remains in Arizona until 2023. As the planets travel from west to east on the geodetic map, all I can say to New Mexico is that the same grouping of planets is headed our way. Fortunately, by the time Transpluto gets to New Mexico (twelve years from now) Neptune and Chiron will be but a distant memory even if the wind is blowing them our way long before their due date. But tonight the moon outshines the smoke.